The dream of cutting all emissions in the energy supply and drives is taking shape in different industries. Lithium-ion batteries play here an essential role. They provide excellent advantages in terms of service life, costs, safety and efficiency. But their technology is also susceptible to thermal risks and this places new demands on fire protection in the engine compartment. Themamax considered these demands and developed a solution. Lithium-ion batteries are chemical energy storage systems that release the stored charge through a chemical reaction. In the event of a failure, lithium-ion batteries can reach temperatures of more than 1,000 Celsius. This overheating can lead to fire. Lithium-ion batteries are classified as dangerous goods in transport or storage. They respond to their environment with great sensitivity. In any event, the energy sources should never be directly or permanently exposed to higher temperatures. Thanks to our longtime experience with high-temperature insulations, we can contribute to the operational safety of battery systems. The Tmax-Battery Housing protects the environment against the effects of thermal runaway and the battery against the risks of high ambient temperatures. To protect lithium-ion batteries against fire, it is not enough to just develop high-temperature insulation. Instead the temperature must be monitored permanently. This is why the Tmax-Battery Housing has thermal management with high-performance cooling. 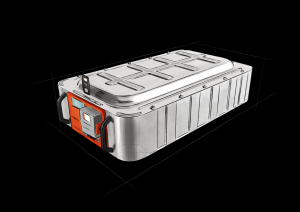 The insulated housing reliably protects the battery from external influences, such as water, extreme temperatures, dust or vibrations. If there is a strong increase in pressure, the safety valve opens and thus prevents a possible explosion. The valve automatically closes when the pressure drops.